Boasting a rich history, cozy accommodations, delicious cuisine and spectacular mountain views, the Baldpate Inn is a traditional mountain getaway that has been enchanting visitors for nearly 100 years. Built in 1917, the Inn is located seven miles south of Estes Park next to the Rocky Mountain National Park and offers a variety of things to see and do. Well-appointed guest rooms are decorated with country mountain flair including handmade quilts and calico dust ruffles and feature en-suite bathrooms and spectacular views. Guests are treated to a delicious gourmet three-course breakfast every morning and complimentary bedtime snacks. An intimate library and comfortable lobby offer the perfect place to curl up with a book in front of a crackling fireplace. The nearby Rocky Mountain National Park provides a variety of activities from hiking and mountain biking to mountain climbing, fishing and wildlife watching. The Baldpate Inn features 12 well-appointed guest rooms in the main lodge, four secluded cabins, and a historic homestead, all of which are decorated with distinct country mountain flair and have spectacular panoramic views. All guest rooms have king or queen-size pillow-top beds dressed in high-quality linens, down or hypoallergenic comforters, and pillows. Some rooms have sinks, and some have private bathrooms with shower/bath combinations, separate showers, and soaking tubs, single or double vanities, lighted make-up mirrors, plush towels and bathrobes, and organic bath products. Sitting areas have plush sofas and overstuffed armchairs, writing desks and chairs, and large windows with stunning mountain views. Modern amenities in all suites include individual climate control with heating and cooling functions, mini-fridges, flat-screen televisions with cable channels, clock radios, irons and ironing boards, and complimentary high-speed wireless Internet. Individual Cabins are set away from the main lodge and offer space and privacy, with multiple bedrooms, private bathrooms, spacious living areas, fireplaces, and plush down comforters on the beds. The 1913 Baldpate Homestead has been lovingly restored to provide exceptional bed and breakfast accommodations with three bedrooms, two bathrooms, a fully equipped kitchen and dining room, a comfortably furnished great room with a fireplace, a solarium and a fully stocked library. A complimentary European-style buffet breakfast is served each morning and includes freshly brewed coffee and tea, fruit juices, fresh seasonal fruit, egg dishes, and Italian meats and cheeses. Other delectable daily selections include newly baked sweet treats such as homemade quiche, croissants, or blueberry muffins, hot home-baked cinnamon rolls, homemade granola and Greek yogurt, and an assortment of fresh bread, jams, and preserves. The Baldpate Inn features a variety of comforts and facilities, including a private, fully stocked library and comfortable lobby with a massive stone fireplace, and an elegant dining room where a complimentary European-style buffet breakfast is served each morning. 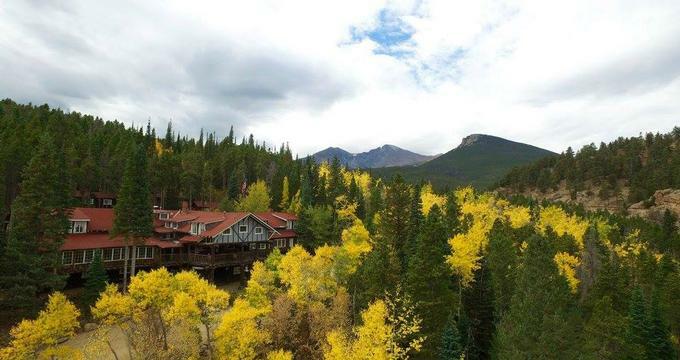 Attractions and activities in and around the Baldpate Inn include hiking in the Rocky Mountain National Park, custom tours of Estes Park, cultural arts and events at Estes Park, horseback riding and rodeo watching at Estes Park’s Stanley Fairgrounds, and fly-fishing in one of the area’s many lakes and streams. Other activities include boating on Lake Estes, summer music festivals in Bond Park and at Performance Park, golf at Estes Golf Course, shopping in the antique stores, boutiques, art galleries, and shops of downtown Estes Park, and recreational pursuits like whitewater rafting, putt-putt, go-karting, and bumper boats. Estes Park is home to several attractions, including the Colorado Model Railroad Museum, the Sunset Memorial Gardens, and the University of Northern Colorado. Other attractions in the area include the Rocky Mountain National Park, the Roosevelt National Forest, the Indian Peaks Wilderness, and the Arapaho National Forest. The Baldpate Inn offers a beautiful setting for special celebrations such as weddings, receptions, ceremonies, and birthday parties of up to 100 guests. The Inn provides a variety of exclusive wedding packages, guest services and professional event management, along with deluxe accommodations, upscale amenities and gracious hospitality.